Superstar Shah Rukh Khan was honoured with the 24th Crystal Award at the World Economic Forum in Davos, Switzerland. 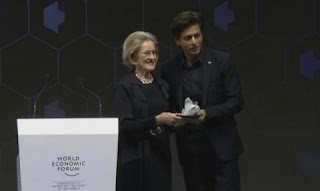 Shah Rukh Khan received the 24th Crystal Award for "his leadership in championing children's and women's rights in India," the World Economic Forum (WEF) said. Shahrukh received the award along side Elton John and Hollywood actress Cate Blanchett. ''Honoured to receive the World Economic Forum's 24th Crystal Award, together with Elton John and Cate Blanchett. My fan moment," Shah Rukh tweeted.